NEO is up 4.61% and if this rate of revival continues, sooner or later NEO prices would be testing $90 if not $110. In my view, it’s time to buy NEO considering recent events. Otherwise, we can shift our attention to EOS which is also expanding and to some degree Litecoin as it continue to on-board merchants. 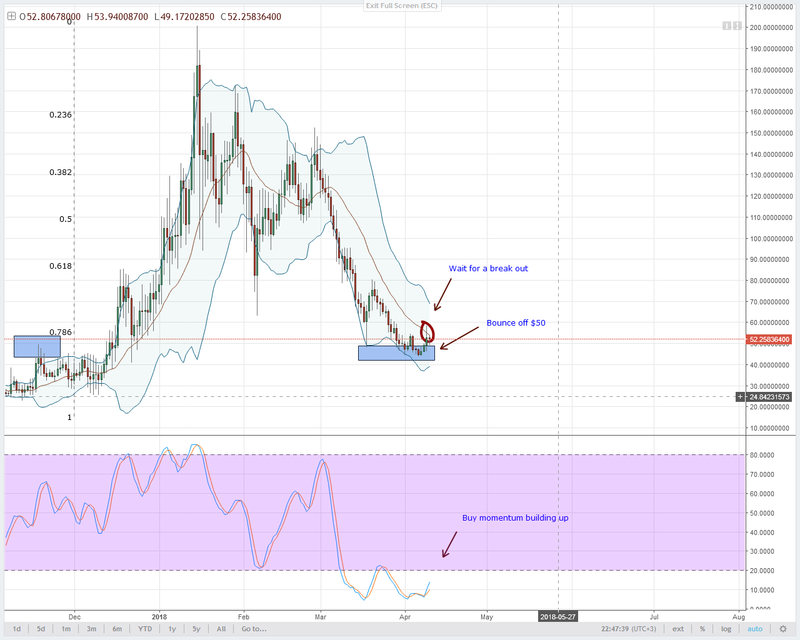 Not only is Stellar Lumens price action slow, it is also boring. Over the last 2-3 weeks, we have been predominantly focusing on what ifs and probabilities of prices edging past the main resistance trend line in the 4HR chart and $0.22 in the daily chart. 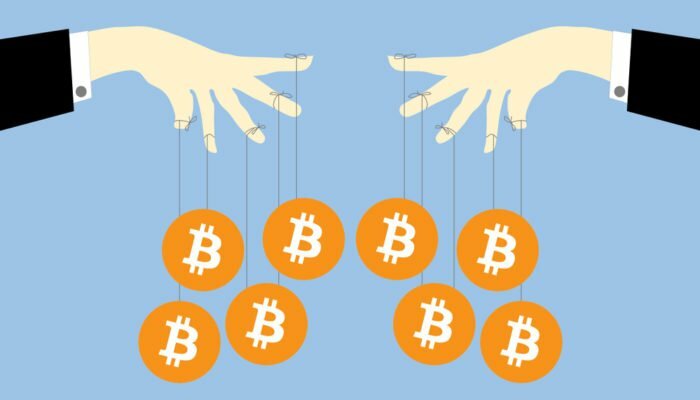 In my view, it will remain so even though cryptocurrencies seems to be waking up from their deep December slump. Based on price set ups in the 4HR chart, I remain net bearish despite yesterday’s 2.15% gain. However, if prices burst through the resistance trend line and $0.22 or this week’s highs, then I will buy and target $0.30 in the short term. Apparently, IOTA is on a recruitment drive and with new talents, prices are finding support. 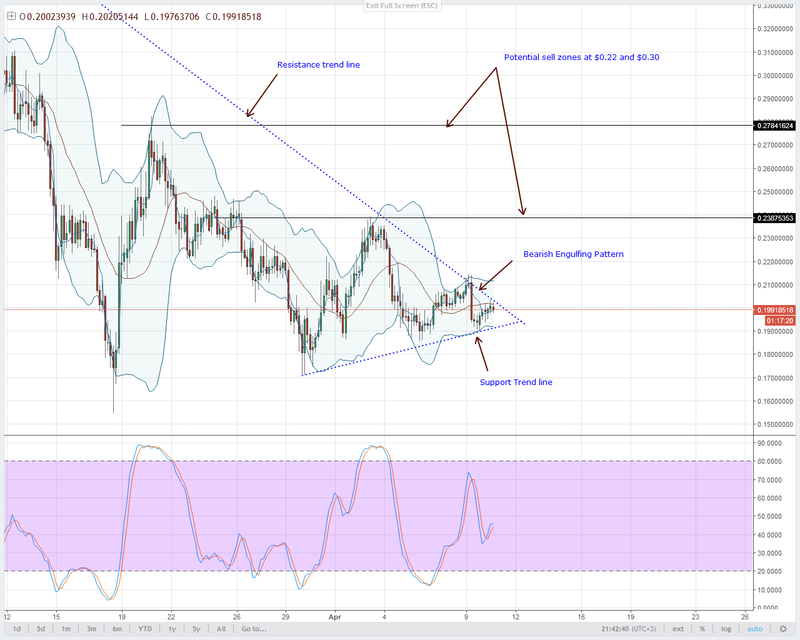 A single glance in the 4HR chart and it’s no secret that IOTA buyers are likely to reverse some of their earlier losses. Why I’m I positive about this? First, notice that IOTA is reacting at $1, a round number and an obvious interest integer for traders. Secondly, besides increasing momentum, IOTA buyers are picking up and trading a within a minor bullish break out pattern in the 4HR chart. Playing strictly by break out rules, this might as well be the trend resumption phase and the 3rd wave of higher highs. Because of this, my first targets are at $1.05 and later $1.25 if momentum is strong enough. Regardless of Livecoin plans to de-list EOS before their mainnet swap, EOS is going from strength to strength. Besides their big, vibrant community exchanges and wallet providers are playing the part in making EOS the largest DApp platform in the world. Yesterday, BigOne, a Chinese exchange announced that it will be holding an “EOS Block Producer Voting Simulation Event”. Boosting this development is news that EOSDAC channel is now active and available at ForkDelta where traders can exchange their ETH for EOSDAC. 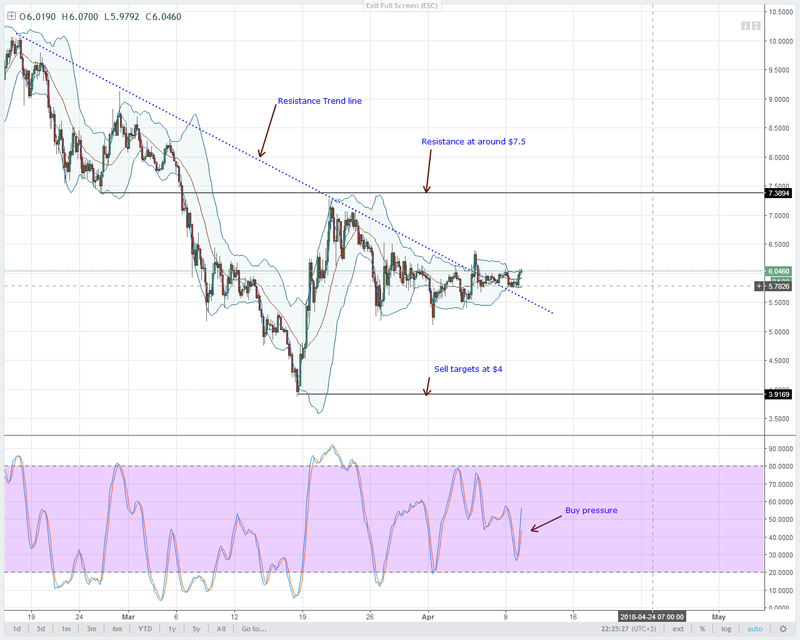 Price action wise, we can see some revival and for the first time in 3 weeks or so, EOS is resilient, making moves above $6. 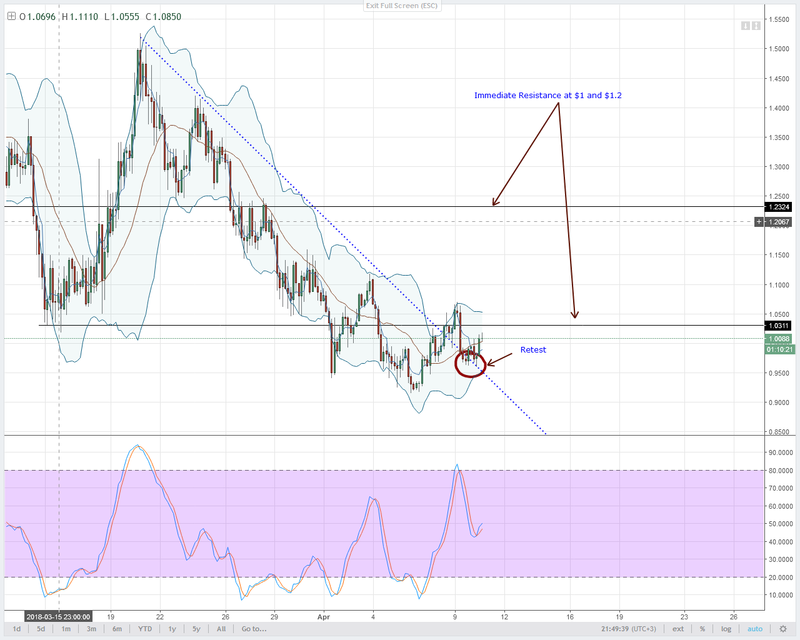 Nonetheless, our EOS daily chart technical analysis hints of an accumulation, it is likely that prices might move up today. In that case, I shall retain a medium to long term bearish skew but looking for short term buys with targets at $7.5. Unless otherwise, this is the projection we shall maintain until there is a shift of momentum in the 4HR chart. As it is, buy pressure is building up and we expect EOS to add to their previous 4% gain. Whether this bear market is setting the foundation for a supper bull move or not remains a subject of debate. What I know for sure is that you can now pay for tickets at Cheap Air using Litecoin, Bitcoin, BCash and Dash. Of course, as I have been saying, moves like these are a big plus but as long as there are no “Yuge” movements on the chart, I remain bearish. 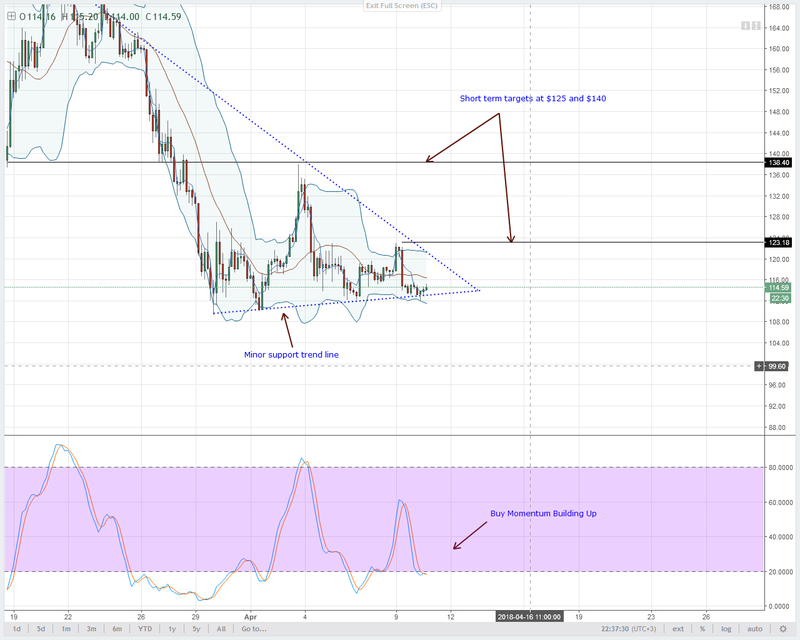 From our previous Litecoin technical analysis, our point of interest was at that support trend line in the 4HR chart. I continue to maintain my view that any break below $110 will usher in sellers who would instead drive prices down to $90. In the mean time though, seller should stay on the sidelines because buy momentum is picking up. As it is, I recommend short term buys with targets at $125-this week’s highs and $140-our main resistance line. NEO is not a China’s Ethereum, NEO is NEO! Because of this, enthusiasts should queue as they wait to hear nuggets from QLink, NEO, Moonlight, ONT, Zeepin, Switcheo and a host of other NEO family from April 14-15. Is this enough reason to go long? Yes technically it is but it depends on price action. All I need to see is a close above $60 in the 4HR chart and the middle BB in the daily chart. After all, stochastics are trending in the oversold territory in both time frames and NEO buyers are definitely rejecting lower lows.